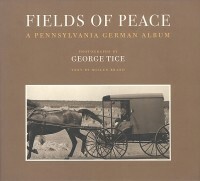 Fields of Peace unites two remarkable talents in masterful volume. The text, written by the late Millen Brand, illuminates the history of the Pennsylvania German sects who were united in their rejection of infant baptism. He provides a sympathetic portrait of these fascinating people (often erroneously called “Pennsylvania Dutch”) who emigrated from Europe in the 17th and 18th centuries, found a home in the sympathetic commonwealth of William Penn, and settled primarily in and around Lancaster County. Primarily Amish and Mennonites, these are quiet and modest people whose lives of determined simplicity and whose passion for land seem totally anomalous in modern America. They continue to live lives of determined simplicity and agrarian focus that have all but disappeared. The photographs by George Tice are some of the most compelling documentary imagery ever framed. In their unobtrusive vision, they capture the substance and the spirit of these self-reliant people. They also reflect over thirty years of gentle but persistent efforts to document their lives and record their customs. For George Tice, this has been a life work, and the breadth and generosity of his vision is manifest on every page. First published in 1970 and here entirely reset with 39 new images added and every photograph reshot for duotone reproduction (as well as a new foreword by Sue Bender and a new afterword by Tice), this is not a “revised edition” but an entirely new book; one that will surely take its place among the classic documentary works of this century. James Dean, Ronald Reagan, Mark Twain: each is a symbol of an era. each an American hero. These men and their hometowns — Fairmount, Indiana; Dixon, Illinois; and Hannible, Missouri — are the subject of this provocative new book by author/photographer George Tice. 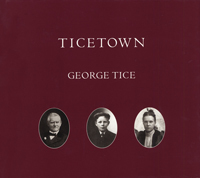 In a wry and eloquent portrait, Tice juxtaposes his contemporary black-and-white photographs– from Winslow Farm where Dean grew up and Lowell Park where Reagan served as a lifeguard to the Delta Queen on Twain’s beloved Mississippi — with a selection of writings by and about the three men. Dean’s high school theme, Reagan’s autobiography. and Twain’s reminiscences of Life on the Mississippi as well as fan club newsletters, movie reviews, local news-paper clippings, and the transcript of a radio broadcast collectively transport us into the past, illuminating Tice’s contemplative view of these Midwestern towns today. In documenting the heartland roots of this trio of legendary figures, the photographer incisively and persistently explores what it means to be American. TIce eludes pat answers in favor of evoking some provocative questions: What makes a hero? What can hometowns tell us about their native sons? And how has celebrity informed the character of these locales? 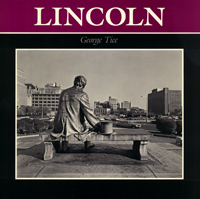 This collection of forty-seven photographs renowned photographer George Tice celebrates Abraham Lincoln and his influence on American life. With an eight-by-ten view camera, Tice chronicles how America honors one of her most illustrative heros. The photographs speak of myth and reality. They evoke a sense of Lincoln as omnipresent, watching over all of us. 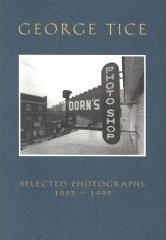 A 10th-generation native of New Jersey, renowned photographer George Tice began his thirty-year documentation of the vernacular architecture of his home state with Paterson in 1972, which formed part of his acclaimed one-man show at Metropolitan Museum of Art. His most iconic images from this exploration are White Castle, Route 1, Rahway, N.J., and Petit’s Mobil Station, Cherry Hill, N.J. In Paterson II, Tice revisits his source of inspiration, adding scores of new images, and making an eloquent statement about time and change in a small Northeastern city. For more than five decades, George Tice has been photographing the landscape of America, and a number of his images have become icons of their time and field. But no other state has held for him the particular affection of Maine — its rockbound coastline, its precarious and isolated islands, its independent and hardworking people. And unmistakably, there is the sense of coming from almost another time and place, and, in the last decade or so, of a landscape transforming itself all too quickly into the conventional palette of the twenty-first century — of its fast-food predictabilities, strip mall excrecences, and the anonymous tangles of the internet highway. 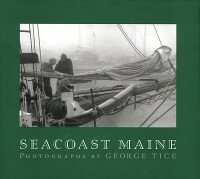 This book makes its focus the Maine we all want to remember and the coastline we perhaps visited at one time and grew to love. Tice, for the past five years, has concentrated on assembling and arranging his favorite photographs. The result is comparable in its scope to Szarkowski’s portrait of Minnesota and in sympathy to Evans’ elegy to Alabama. In all, 107 quadtone photographs, from the fogs off Eastport to the lobster boats off Monhegan, from the grain elevators of Portland to the Shakers of Sabbathday Lake. The emphasis is on the coast, on its ports, its people, its geography, and its architecture. And this seems excusable: for most of us, Maine is its coast. It predominates in our mind’s eye, in the popular imagination, and in the images featured in this book. Still, the real rationale of a book like this is to validate the vision and the work of an artist, and this ambition is more than justified by page after page of dauntingly beautiful images, carefully arranged and faultlessly printed. If Maine is a state you hold dear, this is a book that says it all. 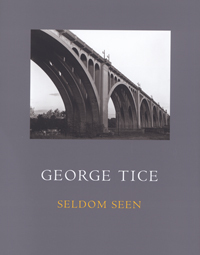 None of these hundred exquisite photographs have been published in any George Tice’s previous books. Four of his major themes are represented in this collection: Patterson, Urban Landscapes, Lincoln, and Hometowns. Most of these images were taken with those volumes in mind but he did not select them for publication for various reasons: space, cost, variants not needed, retrospect, events, time. The images made from 2008 onward are new. In fact they all look new to Tice because he printed them only recently for the first time. We now see images that were locked away in Tice’s file – some for more than forty years- come to life. 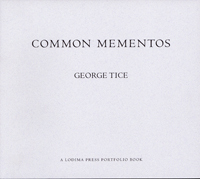 With this publication, sumptuously printed in quad-tone, Tice’s body of work is enlarged considerably. 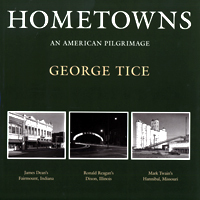 There is much to savor in this collection, from the Great Falls of the Passaic River in Paterson, to Tice’s momento mori of the now vanished twin towers of the World Trade Center, to how America honors Lincoln, her greatest president, to Winslow Farm in Fairmount, Indiana where Tice’s idol, the actor James Dean, was raised. Times have changed, decades have passed, but Tice’s vision remains consistent, understated and masterful. No photographer published in recent years deserves more exposure or more acclaim than George Tice. He has the sensibilities of an urban romantic, and his work ranges from the resolutely rural to haunting still lives of an urban and suburban America whose tableaux of decay and casual abandonment, of genuinely majestic contradictions, reveal a country in the throes of change and yet somehow still clinging to an idealized past. 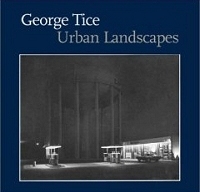 Tice is unusual, perhaps unique, in his affection for the forms that define our landscapes, and for his uncanny eye – as sensitive as Walker Evans’, as precise as Eugene Atget’s – for capturing images that are at once immediate and timeless, simultaneously modern and classic. This is his own selection of his best images, a striking collection from five decades of consistently outstanding work. George Tice is one of America’s greatest photographers of the urban landscape. In 1990, he visited Yorkshire for the first time, ‘an alien on a foreign planet’, as fellow in photography at the National Museum of Photography, Film and Television in Bradford and Ilkley Community College. 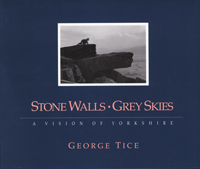 Following the publication of Stone Walls, Grey Skies in October of 1991, George Tice made three more visits to Yorkshire. 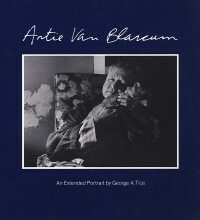 This expanded edition includes thirty photographs not previously published. The photographs of George Tice combine an appreciation of beauty with the grittiness of ordinary experience. 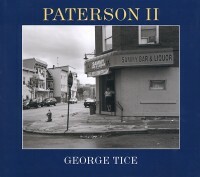 Tice, the photographer/author of books like Hometowns: An American Pilgrimage, Fields of Peace, and the award-winning Paterson, has turned his camera many times to his native New Jersey. But these images of his home state, taken over the past thirty years, could be almost anywhere in America. They portray the movie theaters, shops, dwellings, and street scenes we have grown up with in cities large and small. Without the slightest effort to romanticize, Tice honors the commonplace with an extraordinary eye and a photographic excellence that is evocative to those of us who have experienced these settings. These pictures will stand the test of time as monuments to the American scene for future generations.